If ever there was a perfect example of everything The Movie Mind stands AGAINST, this episode was it. It was as if David Chase (Sopranos creator) knew everything The Movie Mind stands for and decided to create an episode to the opposite effect! Alright, maybe that statement is a little bit far-reaching, but even though he has no idea who The Movie Mind is (for now! ), this episode was built in such a way that it proves my strong beliefs. I can just picture David Chase laughing hysterically at the thought of millions upon millions of viewers slamming their TV sets, cable boxes, and remotes as the picture cut to black in the midst of Tony talking, assuming a last second technical hiccup. The next morning we all learned the only hiccup was that of the Sopranos creator almost choking from laughter at us all. I feel robbed, like Paulie or Tony himself strung me along for an hour each week with promises of satisfaction and thrills and endless water-cooler talk, only to have them invite me to “go for a ride” and invite me to sit in the front seat. Next thing I know there’s some chicken-wire around my neck and I black out. Come to think of it, that sounds eerily like what they actually did to us all! One area which this episode succeeded greatly was through bringing out all the intellectuals and deep-thinkers out in droves. We heard theories about how Tony was shot at the end and that’s why the screen went black and the music stopped. We were told about how the ending gave the audience the same feeling that constantly haunts Tony, with someone always out to get him and how he will forever be looking over his shoulder. There were even asinine stories about how the onion rings in the diner symbolized communion wafers at church. The only truth to it is that the coward creator and writers couldn’t make the choice themselves so they left the audience guessing. What a miserable way to end the reign of what had become one of the greatest shows of all time. This is comparable to movies where you buy the DVD and it has “alternate endings”. In fact, maybe Chase should have done that. Just give us different scenes at the end where Tony is shot, or his family is shot, or he gets arrested, or they all go home from the diner and talk about living happily ever after. You could even make the whole thing a dream sequence so the audience has no idea which is real and gets to decide for themselves. It’s too bad we as viewers aren’t given the benefit of the doubt that we could cope with a real ending, regardless of what it would be. The rest of the episode was nothing to write home about either. It was extremely anticlimactic when Phil Leotardo got popped, only to tease us that the episode would start going in the right direction when the car ran over his head and scrunched it like a watermelon. Other then that, it was nice to see Anthony Junior take his miserable life and miserable character and turn it into something. Actually, no it wasn’t. I would have been happier if he left in a fit of anti-terror rage (by the way, could Chase possibly cram anymore political propaganda down our throats?) to Afghanistan never to return. But hey, at least we can go away knowing Meadow can’t parallel park to save her life. I am mad at myself for putting so much faith in the idea that after giving us 2 final ho-hum seasons, we would have been humored with a finale to exceed all expectations. That they would have stopped taking themselves so seriously (which is what got the show off track in the first place), and remembered the real reason they were successful in the first place: people want to see the double life of a man who murders, cheats, and steals by day, and lives the life of a family man by night (or maybe vice versa). 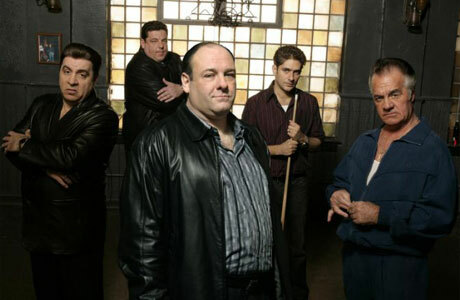 We want to see a man who is the most feared and powerful man in the pseudo-reality world of The Sopranos, struggle with his inner demons and turn out to be as vulnerable as any of us schmo’s watching the show. Instead we get some pencil-pushers fighting about the importance of some bit characters we saw for 2 seconds in last few minutes because they were in one episode 4 seasons ago. This episode merely proves what has been in The Movie Mind all along, that the best show on TV the last 2 years has been Rescue Me, and not The Sopranos.